Ok lets hit it, I now title the rest of the blog post, the constant beaming smiles of Ellie!!! 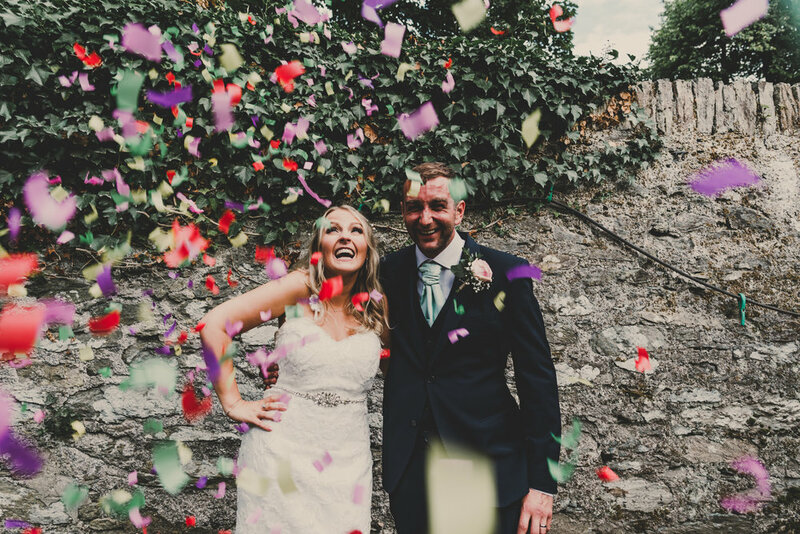 This couple chose the most exquisite festival wedding venue of Carreglwyd Estate. They chose this venue because it was so special and unique to their beautiful love story, they actually got engaged on a super beautiful bench at Gottwood festival just before walking into the area where they got married, so I guess there’s no better location imaginable than to get married there! I’m going to tell you more about their beautiful love story later on! 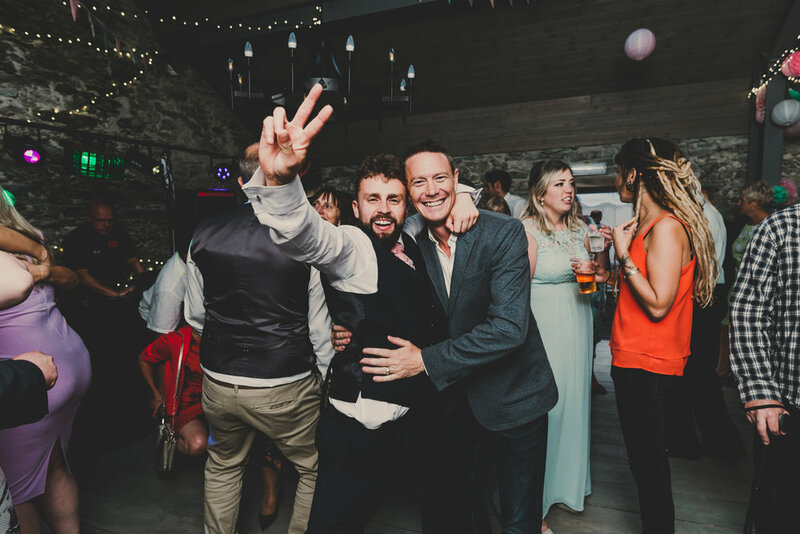 So did you know that festival weddings were right up there as my all time fave? No!? – seriously how the hell did you not know that!! I strongly suggest you go check out my about me page then, or my ultimate bucket list wedding blog. So Yes, it’s true, there’s nothing more satisfying than photographing a festival wedding, and even more satisfying in fact that this day was in the most epic of locations up in Angelsey, on the Carreglwyd estate, right on a lake complete with a giant hand coming out the water (I must actually check the significance of this), This venue is actually a festival venue anyway, hosting gotwood festival each year… another note to self here, must get tickets for next year!!!. This wedding was of the coolest most gorgeous couple Ellie and Spencer and their freaking awesome friends and family, I mean how cool that one of their friends even helps host the summer solstice festival down by Stonehenge. 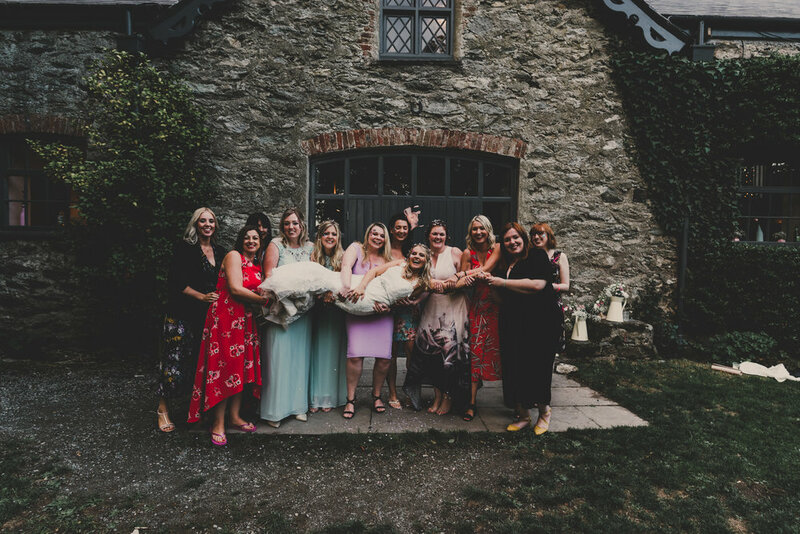 I felt like I had known this tribe forever, like they were all my friends, even with Dolly the dog (because she’s a mixture) now this is what a wedding should be like! Guys – can I join your tribe officially? Ha!!! On the morning I headed straight to Ellies parents’ house, were I hung out with Ellie, her bridesmaids, her flower girls, her mum and dad (oh my gosh they are the most loveliest people ever) and Ellie’s brother Matti who sat as cool as a cucumber at the breakfast bar most of the morning, whilst Rachael my second for the day headed straight to the venue to hang with Spencer and the guys. Not even the weather phased these babes, with torrential rain all morning, and stopping briefly before their ceremony, they still braved an outdoor ceremony on the lake, were total babes about adventuring around with me. They rocked their glitter booth, gosh I’ve never seen so much glitter in my life, and if I hadn’t have had a wedding the following morning I would have showered myself in it too, Spencers speech was probably one of the most unique I’d ever heard and obviously I’ve heard lots, usually you can tell a google search has happened, but Spencers was something special, about their story of meeting over noodles and sweet and sour sauce, definitions of Ellies name – and seeing Ellie, laugh, smile, and never take her eyes off him. it was fab, and I loved Ellie’s dads jokes about songs to sing about them becoming Kidds and how Ellie was always destined to be a teacher! 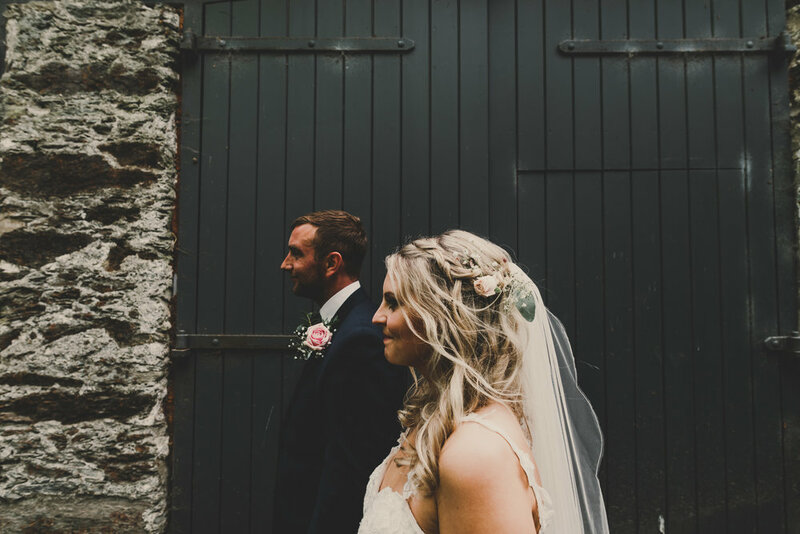 Ellie Wore a stunning gown by Wedding Belles, Llanfair PG with the most stunning 3D lace applique, completed with wait for it… sparkly Jimmy Choo courts. Spencer and the other suits were all from Debenhams, and dapper they sure did look. The bridesmaids gowns were all from Lipsy and man that colour was gorgeous, really stunning in fact! Now I want to tell you a bit about Ellie and Spencers story, these babes met at a Noodle bar at Hevy Festival, Kent in 2011 (I remember during Spencers speech he didn’t even really like noodles but that in the que in front of him battling with sweet and sour sauce was Ellie and the rest was history) These babes even had noodles for the evening snack on their wedding day! 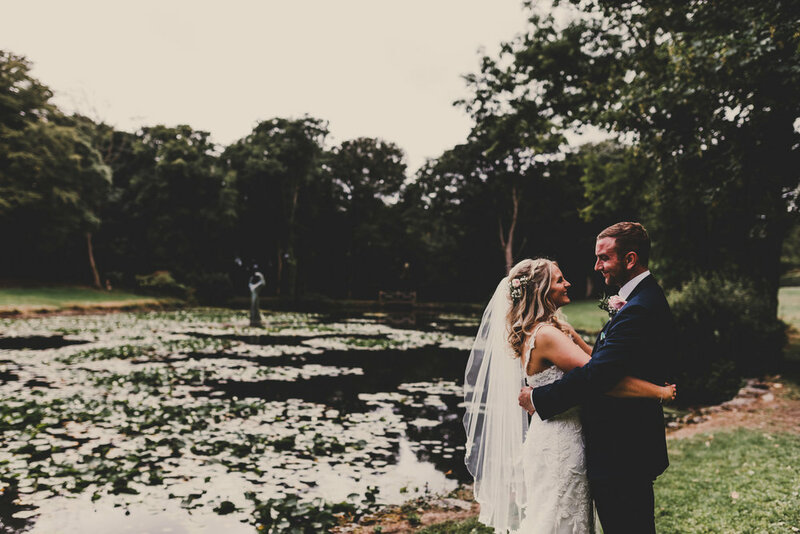 When they got engaged, Spencer and their friends crafted a plan of getting into Gottwood festival where they all went for a walk and swiftly their friends decided to go a different way, leaving Ellie and Spencer at a bench near to the boathouse where they got married, where Spencer proposed in July 2017. I asked Ellie about her wedding journey, Ellie had said that she enjoyed the food tasting (I remember a funny part of their speech coming to my head here :-p) Shoe shopping, looking for flowers and the cake. The parts that was found challenging were the RSVPs, the table plan and things outside of Ellies control. 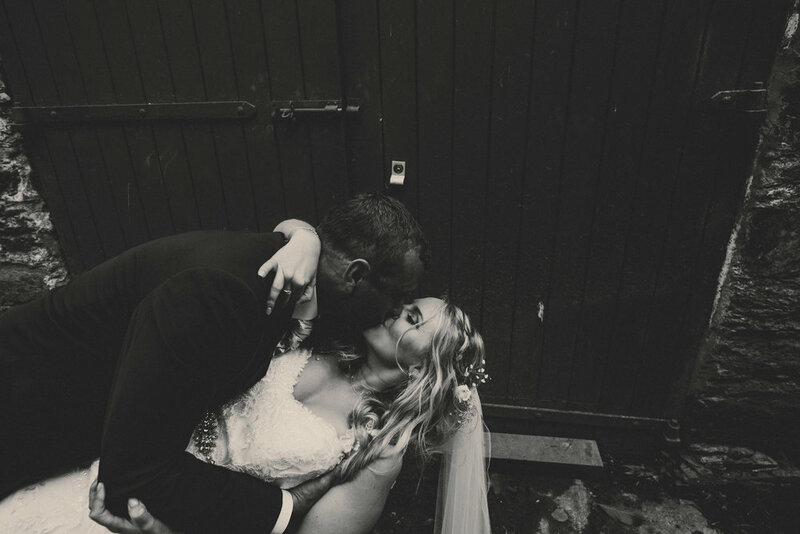 Ellies advice to other brides is to book vendors ASAP, focus on what is right for you as a couple and relax! Thank you so much for being babes and allowing me to hang with you all.